Primarily attacking the left half of the thyroid gland as a fist sized hard tumor, visual and tangible, which is stretched downwards as far as the shoulderbone, upwards as far as the mandible and towards the back almost as far as the vertebrae. Larynx somewhat shunted to the right . The tumor, growing together with the adjacencies, was immobile during swallowing. The left neck and the adjacent upper chest and shoulder regions are taken up with a spreading network of pinky finger to pencil thick veins. 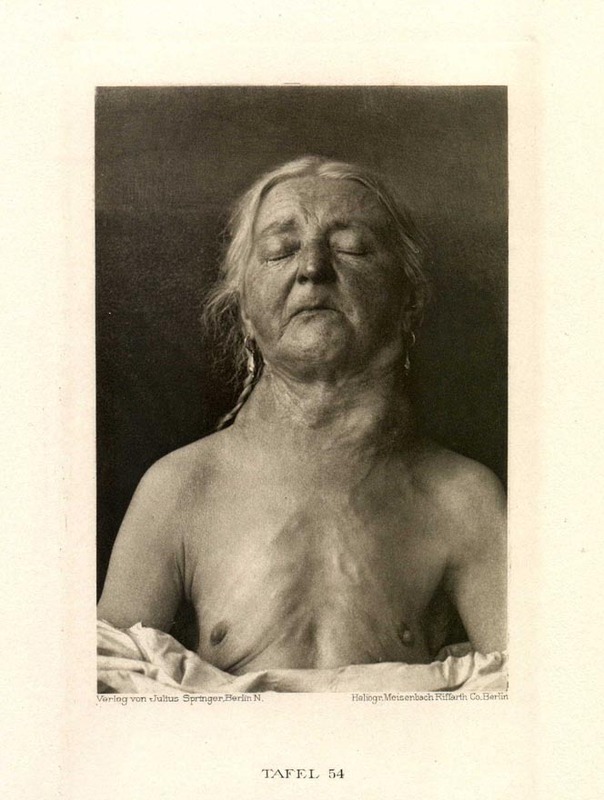 Face, arm and right side of the neck clear of the excrescent veins, whereupon it appears certain the cause of the mentioned network of veins is locally circumscribed. 67 year old distiller’s widow. Chronic alcoholism. Diffuse arteriosclerosis. Death from cardiac failure.